El Salvador's ecological and social crises are rooted in an historical conflict over control and use of land. Both the land use patterns and the conflicts themselves have furthered environmental destruction in El Salvador. This small Central American nation has always been a primarily agricultural country and despite recent shifts, agriculture has continued to be the backbone of the economy. Conflicts and peasant uprisings over land date back more than 4 centuries to the arrival of the Spanish conquistadores. Since the late 19th century, the most fertile lands have been concentrated in few hands and used to grow coffee for export, forcing small-scale farmers onto marginal quality lands and making their subsistence increasingly precarious. A vicious circle was created whereby concentration of land by the wealthy furthered inequality, which led to land degradation and caused conflict that finally escalated into full scale civil war in 1980. Twelve years of civil war wreaked havoc on the environment, largely a result of the government's 'scorched earth' strategy designed to eliminate the insurgency's base of support in the countryside. The result was a serious worsening of an already degraded environment, more than 70,000 civilians dead, and more than 20 percent of the population displaced from their homes, forcing a massive migration to urban areas which has placed further stress on the country's fragile ecosystem. As a consequence, in the war's aftermath renewed tensions have arisen over land and the ecological impact of its use near urban areas. The assault on the environment and the people of El Salvador, just as in the rest of Central America, began when the Spanish colonizers identified the region's value in its potential agricultural wealth. Exploitation of the land for the benefit of the empire went hand-in-hand with exploitation of the indigenous peoples. With the introduction of coffee plantations in the 1840's, land holdings became further concentrated and peasants increasingly disenfranchised. In 1881-2, the Salvadoran government abolished all rights to communal land holdings and gave control of over 25 percent of the country's most fertile land to large landowners for coffee production. This established pattern has continued throughout the 20th century, reflected by the expansion of agro-exports and centralization of land holdings under the control of a small class of wealthy landowners who effectively monopolized the best land and resources. The concentration of the most fertile lands into large holdings for agro-exports pushed small-scale farmers to deforest new areas and occupy less fertile, marginal quality lands, much of it located on hillsides. Deforestation and soil erosion have ensued, causing destruction of watersheds, loss of groundwater, and siltation of waterways. Continued disparity in the size of land holdings has led to over-exploitation of land and further soil erosion. In addition, as small-farmers have become increasingly impoverished, they have been unable to employ conservation measures and cannot afford to let their even smaller plots of land lay fallow. By 1971, El Salvador had the highest land concentration in Central America: 1.5 percent of farms operated 49 percent of agricultural lands, while at the other extreme 87 percent of farms operated less than 20 percent of total acreage and occupied less than 3.5 hectares (1 hectare = 2.471 acres) each, the average size being 1.2 hectares. (James K. Boyce, ed. 1996: 21-23) While the specific distribution of soil quality of these farms was not known, anecdotal evidence shows that small-scale farms tended to have poorer quality, less productive soil. Government surveys from 1978- 82 showed that only 17 percent of El Salvador's total land area of 2,104,100 hectares could be classified as high quality soil apt for intensive agricultural use, although another 29 percent of varying quality was considered appropriate for agrarian usage. However, 35 percent was shown to be of poorer quality, more susceptible to erosion and best suitable for forest cover and some grazing lands, while another 13 percent was classified as severely degraded (the remainder of the territory was occupied by urban infrastructure or waterways). Yet nearly half of land apt for intensive use was actually underutilized, while three-quarters of crop cultivation occurred on marginal, degraded land. (SEMA 1994: 39) The former category describes land owned by the wealthy elite, while the latter portrays the situation of most subsistence farmers. As a result, subsistence farming was becoming inviable as means to maintain the livelihoods of the majority of the rural population. The historical pattern of land distribution in El Salvador is clearly a root cause both of environmental degradation and of the social conflict which broke into full scale civil war in 1980. In an attempt to forestall the growing civil unrest in the countryside, a much touted Agrarian Reform program was pushed through in early 1980 with the full backing of the U.S. government. Yet, because the program failed to redistribute the best lands and reorient production, it turned out to be ecologically unsound. Although 295,000 hectares were redistributed through the Agrarian Reform program, this did not represent a major gain for poor farmers. Under Phase I of the three-phased reform, estates of more than 500 hectares were nationalized and parceled out to new landholders and cooperatives. However, most of the land had been cattle ranchland and 45 percent was considered nonproductive while most of the rest was of poor quality. Phase III, called the 'land to the tiller' program, gave title to some peasant farmers renting the most marginal and degraded land in the country. The program served to exacerbate erosion, reduce yields of basic crops, and trap peasants in a vicious circle of increased inputs (fertilizer and insecticide) and decreased income. The most substantial part of the agrarian reform - Phase II, which would have broken up the large, fertile estates that produced at least 30 percent of the nation's coffee - was never implemented. (Faber 1993: 211) Thus, the 1980 Land Reform program did not resolve the problem of inequality of land distribution in El Salvador. Social unrest escalated, a result of increasing poverty, landlessness and inability of small-scale farmers to subsist on their plots. The military regime that had ruled the country for nearly half a century in service of the landed oligarchy, responded by heightening and broadening the repression. Full-scale civil war had broken out by January, 1981. Twelve years of civil war further devastated El Salvador's already degraded environment. The 1980 Agrarian Reform program was part of the U.S. sponsored low-intensity conflict strategy which combined limited socioeconomic reforms designed to appease civil unrest with a military effort to defeat the guerrilla insurgency. However, the conflict was only 'low-intensity' for the U.S. government, which spent more than $6 billion on the war effort, accounting for more of the country's budget than provided by El Salvador itself. This U.S. support was a result of foreign policy at the height of the Cold War. Ronald Reagan came into office in 1981 pledging to 'draw the line against communism' in El Salvador, thus turning the Salvadoran civil war into a low-intensity proxy war. However, the civil war was extremely high-intensity for the Salvadoran people and their ecosystem. 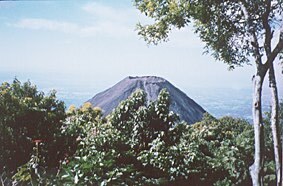 Much of the richest and most fragile parts of El Salvador's ecosystem were severely damaged by the war in general, and the air war in particular. The country's volcanoes and mountainous cloud forests were especially targeted for bombings as they were suspected strongholds of the insurgency. Thus, this scorched earth strategy caused further deforestation, destroyed some of the last wilderness areas in the country and severely damaged agricultural soils and watersheds, contributing to soil erosion, siltation of waterways and loss of groundwater. However, destruction of the environment was not only a result of the air war. Elite, U.S. trained, ground troops also targeted villages suspected of supporting the insurgents. Thousands of civilians were massacred in such sweeps. Yet more often, villagers were forewarned and managed to flee in guindas. Nevertheless, the army succeeded in carrying out its mission by destroying all means of livelihood in the area: croplands were burned, animals were slaughtered and water sources were polluted. The military objective was to leave the area uninhabitable so that the villagers could not return and the insurgents would be deprived of a base of support. Thus was the strategy of draining the sea to catch the fish. The United Nations-mediated Peace Accords to end to the armed conflict, signed in 1992, were not expected to resolve the socio- economic causes of the war. The FMLN (the counter-part to the Salvadoran government in the conflict) recognized that the costs, in human and environmental terms, of continuing the war in an attempt to force the economic elite and landed oligarchy to concede their economic power, were too high. The Peace Accords successfully mandated an end to militarization and an opening of the democratic process, in the hope that future battles would take place in the political arena. While the Accords included a Land Transfer Program to benefit those most directly involved in and affected by the war, the program only involved slightly more than 5 percent of the national territory, most of which did not include the most fertile lands. Thus, the Peace Accords began the process of reconstruction, reconciliation and democratization in El Salvador. However, they did not significantly alter the unjust economic system based on a highly unequal distribution of land and access to resources. The struggle to change the economic model continues today on the political battlefield, where in the recent March 1997 elections the FMLN (the former insurgency now turned political party) won a significant number of municipal governments, including the capital, and increased representation in the national legislature. With the war over and the race to enter the 'age of globalization,' new and increasing pressures of urbanization and environmental degradation continue at a rapid pace. Yet according to a recent study, the relationship of environment to democratization and development has yet to be clearly recognized by policy makers in El Salvador. Although the land is degraded to the point at which the country's capacity to renew its most basic resource for development, water, is being lost, measures are not being taken to address the root of the problem. (James K. Boyce, ed. 1996: 233) Compounding the problem is an increasing rural-urban migration, a result of the war and the fact that small, degraded plots of land no longer produce enough for farmers to survive. Between 1971 and 1992 urban population grew by 82 percent, and the majority of the population now lives in urban areas (Vasquez 1994: 5). This situation has led to renewed conflict over land and the environment, illustrated by one case which is pitting environmentalists and members of a coffee-growing cooperative (beneficiaries of the 1980 Agrarian Reform), on the one hand, against the government and wealthy elite, on the other. This social conflict involves the coffee plantation known as El Espino, which covers 802 hectares on the western perimeter of the country's quickly expanding capital, San Salvador. It is the area's only remaining natural forest, popularly referred to as the 'lung' of the capital because it provides a key source of groundwater replenishment for the area's watershed. Carefully managed by a coffee-growers' cooperative, the land harbors more than 50 species of trees and shrubs, which shelter 70 species of birds, some of which are not found elsewhere in the country. Nevertheless, the cooperative members stood their ground. They refused to recognize the Supreme Court decision, citing legal inconsistencies and lack of trust in a Court named by the wealthy elite who were favored by the ruling. They galvanized support from environmental groups, and seemed to be gaining ground in their efforts to have the area declared an ecological reserve. But in September, 1991, the government ordered the return of El Espino to the Dueñas family and recommended the subsequent repurchase of most of the land by the government. Thus, not only was the Dueñas family paid twice for its land (once at the meager value of $2.7 million that it had declared for tax purposes, and later at $12.2 million for only 62 percent of the property), it immediately turned around and sold a portion of prime property for development of a new shopping center and upper-scale residential housing. However, this new deal still left unsettled the matter of the El Espino coffee cooperative and its 5,000 members, who have actively resisted all attempts at eviction. There have been various mediation attempts, new laws passed regulating use of portions of the property, and extensive government propaganda campaigns asserting that preservation of the environment is its primary concern. The government has proposed giving title to 388 hectares to the cooperative, and turning the rest of the government land into a park. However, cooperativists and environmentalists continue to actively protest plans of the government, the Dueñas family and others involved in the land deals. In addition to opposing new urban construction in El Espino (which has not yet begun), environmentalists oppose the establishment of a public park on the grounds that it would overly develop the area and destroy the fragile ecosystem. While the public park project appears to be stalled, preparations for urban development on land given back to the Dueñas family have progressed. As the El Espino case illustrates, land use and inequality continue to be a cause of conflict and environmental problems in El Salvador. Inequality in land distribution exacerbated environmental degradation and led to civil war. The war itself caused extensive environmental destruction. In the post-war period, land use and environmental concerns are causing renewed social tensions. Mammals: 135 known species, 2 are threatened (more than 20 species have disappeared, including the jaguar, howler monkey, tapir and giant anteater). Birds: 420 known species (at least 18 species are now believed extinct). Reptiles: 73 known species, 4 are endemic and 6 are threatened. Freshwater Fish: 16 known species. Higher Plants: 2,500 known species, 17 are endemic and 35 are threatened. Land use and inequality have historically been a cause of conflict and environmental problems in El Salvador. Inequality in land distribution exacerbated environmental degradation and led to civil war. The war itself caused extensive environmental destruction. In the post-war period, land use and environmental concerns are causing renewed social tensions. The concentration of the most fertile lands into large holdings for agro-exports pushed small-scale farmers to deforest new areas and occupy less fertile, marginal quality lands. Small farmers, the majority of the rural population, became increasing impoverished and disenfranchised. As deforestation and soil erosion ensued, environmental problems worsened with the destruction of watersheds, loss of groundwater, and siltation of waterways. Thus, inequality in land distribution both exacerbated environmental degradation and heightened social conflict which led to civil war. The war caused further, more extensive environmental destruction. As a result, many small-scale farmers were no longer able to work their land and migrated to urban areas without a means of livelihood, further exacerbating inequality. In the post-war period, land use and environmental concerns, particularly in urban areas, are causing renewed social tensions.